This site-in-progress of Zacuto Foundation commemorates life and works of Rabbi Abraham Zacuto and his Book of Lineage. You are welcome to forward us all materials connected to RAZ. Abraham Zacuto (1452-1514), probably of the first Jewish sages who embraced modernity while keeping the unbroken chain of tradition from Abraham to the Talmud scholars to Moses Maimonides. He was a contemporary of Leonardo da Vinci, a leading astronomer who stood at the cradle of great geographical discoveries of 16th century, advised Columbus and guided Vasco da Gama, was a luminary at the Court of Kings of Spain and Portugal, merged science and Kabbala, taught at Salamanca University and lived in the Templar-built mysterious Castle of Tomar, travelled through the Orient from Tunis to Constantinople, to find his eternal rest in Jerusalem. While meeting with kings and princes, he considered himself first of all a Jewish sage in the long line of Jewish sages. The Book of Lineage, or Sefer Yohassin, his Opus Magnum, was completed five hundred years ago after a decade-spanning work. This is the first historical chronicle covering the entire history of mankind from the Jewish perspective, integrating the records of Jewish chronographers. This book provides a unique insight into the world of the Talmud populated by sages, their wives and their disciples, human beings of flesh and blood, the world he learned from his teacher, the great Jewish mystic Aboab, the author of Menorath Ha-Maor, and he knew it exceedingly well. It is also a primary source dealing with appearance of the Zohar in Spain. Thus this book allows to appreciate wonders of the world of Talmud and tradition, as well as those of pre-exilic Spain and Portugal. The editor of this translation, the Israeli writer Israel Shamir, whose previous projects include the Odyssey of Homer, Joyce’s Ulysses and the Hebrew Nobel winner S.Y. Agnon, keeps to the spirit of this time, and moves forward our understanding of tradition and history of Jews in its interaction with their neighbours. 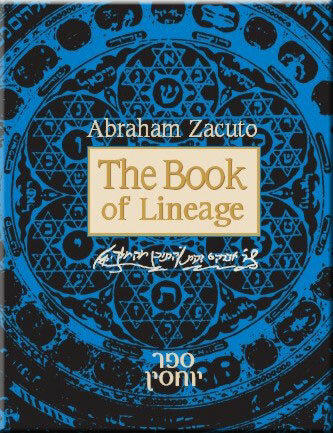 The author of the Book of Lineage, Rabbi Abraham Ben Samuel Ben Abraham Zacuto III (1452 – 1515), could be the main character of a major film or of a great book; his life was full of adventures and accomplishments. His life is surrounded by legend as befits a Judaeo-Iberian sage, and it is quite difficult for us to separate the hard facts from the embellishments. A Renaissance man and a contemporary of Leonardo da Vinci (they were born in the same year), Abraham Zacuto was a scientist and historian, astronomer and astrologer, Talmudic scholar and man of the world. Zacuto was present at the birth of modernity: he advised Columbus before he sailed West, equipped with Zacuto’s astrolabe -- and he advised Vasco da Gama before he sailed East, equipped with Zacuto’s charts. Thus Zacuto stood at the gate of the great breakthrough of European civilisation: discovery of America, of the Cape of Good Hope, of the seaway to India. He was born and brought up in Salamanca, in Castile though the Portuguese dispute it and claim he and his family are from Evora in Portugal. However, he was usually referred to as the Sage of Salamanca, a city of the great University that kept its place of honour next to Oxford and Sorbonne. In 1473, at age of 20, the young Zacuto began his work on his famed solar declination tables, called Ha-Hibur ha-Gadol or Almanach perpetuum coelestium motium (Perpetual Almanac of the Heavenly Bodies), essential for the calculation of geographical coordinates. The tables were completed in 1478 under the patronage of the bishop of Salamanca, Gonzalo de Vivero, who admired Zacuto's extensive knowledge of astronomy and history. In 1481, the original Hebrew text was translated into Spanish by Juan de Salaya, a professor of astrology and logic at the University of Salamanca. Translations into Arabic and Latin followed, and the first printed edition appeared in 1496 in Leiria, Portugal, prepared by Zacuto’s disciple, Jose Vicinho, a Portuguese astronomer of Jewish origin. The tables became a popular and necessary tool for navigation, accompanied by a technical invention of Abraham Zacuto, his copper astrolabe – until his time, this ancient instrument was made of wood and did not allow for desired precision. When Christopher Columbus arrived in Spain, he met with the great astronomer and received a copy of the tables. This manuscript with the marginalia of Columbus is extant in the Colombian library in Portugal. It is often said that Zacuto was also instrumental in raising a big loan for Columbus with the tycoons Abraham Senior, Gabriel Sanchez and Luis de Santangel. A prominent man of Jewish origin, Senior embraced Christianity, while Santangel and Sanchez were born into a recently baptised family. Zacuto also introduced Columbus to Don Isaac Abravanel, a Jewish notable with great influence at the Court, and he arranged for the navigator’s audience with the King and the Queen. Soon Columbus set sail to America, bearing the Zacuto tables with him. The family tradition insists that a young Zacuto, a son of R. Abraham, sailed with him, and accompanied him in all his journeys. If so, this young man was the first Jew on the American soil. It is possible that he advised the Genoese navigator to use his father’s tables in the moment of need. During Columbus’ last voyage to America (1504), his small fleet was marooned on Jamaica, where the natives did not want to supply him and his sailors with food. The Zacuto's tables provided him with a way out as they indicated there would soon (on February 29, 1504) be a lunar eclipse. Columbus assembled the Caciques (as the native chiefs were called) and threatened them that he will banish the moonlight. The eclipse frightened the natives and they asked Columbus to save the moon. Columbus acquiesced, the eclipse passed and since then the Caciques respected him and provided with all he needed, says the legend. Meanwhile R. Abraham Zacuto became a professor of astronomy, first in Salamanca and later at Saragossa University. But the dramatic events of 1492 changed everything. After their conquest of the last Moorish kingdom of Granada, the Royal rulers of recently united Spain decided to convert their Jewish subjects, to finish off in one stroke the hundred years drive for Christianisation of Spanish Jews. With the Moors subdued, there was no need for cultural plurality. The conversion, in the view of Ferdinand and Isabella, would unify the people of Spain under one crown and one church. (They repeated it a few years later with the Spanish Muslims, leaving them with no choice at all). But the plan misfired: thousands of Jews left the country instead of agreeing to the most advantageous proposals of the Crown. The Queen and the King did not expect it, but thus their Edict of Conversion became the Edict of Expulsion. Eventually some forty thousand Jews and many Conversos left Spain, mainly for Portugal. Amongst them was the great astronomer Abraham Zacuto who decided to accompany his master, the great sage and mystic Isaac Aboab. In Portugal, Zacuto’s fortunes even improved. His advice was sought and his abilities as astrologer were also employed. He became the Royal Astronomer at the court of King Joao II and advised Vasco da Gama before his voyage to India in 1497. The Portuguese astronomer and cartographer Jose Visinho considered himself his disciple, translated and published his book and helped him to find a proper place in Portugal. There are many stories of Zacuto’s success in Portugal. It is written in the book of Neshmat Haim: once the King Joao II came to try R. Abraham Zacuto's wisdom. He said he intended to travel to Iborra and demanded to know from the stars through which gate he would enter Iborra. R. Abraham replied, “Whatever I'll say, you will enter by other gate’. The King said, “No, put your divination in writing and seal it with your own seal”. He brought a clean sheet of paper and wrote, “The King will open a new gate and enter through it”. And so it was - the king wanted to prove his fortune telling is false, and broke a new gate into the city and entered through it. As he entered, he opened the R. Abraham Zacuto’s letter and read it out loud, and it was a miracle in his eyes. Another time the King invited R. Abraham Zacuto to his room and enquired about the distance between earth and heaven. He gave the answer: In a year's time the king raised the roof of the room by one and a half cubit and asked R. Abraham: tell me, Astronomer, what the distance between the earth and heaven is, as I forgot what you said. The wise man replied, “Since then, the earth was raised or heaven descended”. Abraham Zacuto spent much time in the Templar-built castle of Tomar, a centre of mystical studies in Portugal. There he established a synagogue which exists till this very day and is known as ‘Zacuto Synagogue’. But the stars did not bode him well: despite his contribution to the successes of Portugal, Zacuto lost royal favour. The last king of Portugal wrote in 1920s of ‘great and burning ingratitude’ of his royal ancestors to the astronomer. The new king of Portugal, Manuel who came instead of King Joao, succumbed to the same idea of forced conversion of his Jews. He did not want to lose these active and useful people, but he felt that their faith interferes with their full integration in his country. Many Jews left for Holland, Turkey and North Africa, but apparently the majority could not leave. The bulk of Zacuto family remained entrenched in Portugal. They were baptised and took names of Rodriguez and Nunez, but when some of their descendents left the Peninsula in 16th and 17th cc, they came back into the Jewish faith and into their old family name. Thus Abraham Zacuto Lusitano (or Lusitanus) was born in Lisbon in 1575, studied medicine in the Universities of Coimbra and Salamanca, moved to Amsterdam in 1625 and became a famous doctor and Rabbi before dying on New Year's Day 1642. Another Zacuto, Moses or Enrique Nunez, moved to Holland in the 17th century, and his sons settled in Venice, Hamburg and Poland. His grandson Moses Zacuto became a renowned poet and mystic, known under the acronym REMEZ. He lived in Poland, Amsterdam and Venice before settling in Mantua where he died in 1697. He studied philosophy under Spinoza and Jewish mysticism under disciples of Vital, edited the Book of Zohar and maintained the Portuguese connection as well. Other members of the noble Zacuto family traded and wrote books elsewhere, from Ukraine to Portugal. But let us return to our Rabbi Abraham Zacuto. Together with his son Samuel Zacuto left for Tunis, and reached this safe haven after many misfortunes, being captured twice by pirates. He pushed a heavy oar on a galley, says the legend, until his captors discovered the extent of his knowledge. Eventually he was duly redeemed by the Jewish community. In Tunis, his son Samuel married into a prominent local Jewish family, and Abraham Zacuto regained some of his peace of mind. His knowledge of Jewish history, astronomy and astrology were combined in his attempts to calculate the End of Days and Coming of the Messiah. His views remained within accepted limits, as he wrote: “Good deeds and repentance save from grief, and Salvation will come sooner if Israel will deserve it”. In his calculations, Zacuto predicted the end of the world and coming of the Saviour in 1514. This belief caused him to leave safe Tunis and wander the roads on the Empire – he went to Constantinople, to Damascus and eventually to Jerusalem in 1513; he lived in a theological college (Yeshiva) on Mt Zion, and died in 1514. Thus his world ended and his soul embraced the Messiah, as he predicted for 1514. His prophecy came true, at least for him personally. But before that, in Tunis he completed his lifelong work, the historical Book of Lineage, a history of the world from Creation to 1500 from the Jewish perspective. The central theme of the book is the great effort of Jewish sages crowned with the Talmud. R. Zacuto was a great expert of the Talmud, the compendium of Jewish tradition which he learned from R. Isaac Aboab and inherited from his ancestors who came to Spain from Provence, France in 1305. Perfect scholars, they studied the Torah under R. Asher ‘Rosh’, under his son R. Judah, the Saint of Toledo, and under Rabbi Isaac Ben Shesheth. On his mother’s side, there were many renowned scholars, too, among them R. Samuel Valenci. His devotion to the Talmud was so great that he considered his scientific work as subservient to his Talmudic studies. In The Book of Lineage he attempts to integrate his knowledge of history and geography with Jewish tradition. Zacuto tries to synchronize Jewish and world events. He places Hippocrates, Euclid, and Plato in the time of Mordecai and Esther, and he synchronizes the time of Priam, King of Troy, with the Jewish judges. Even more important, Zacuto founded modern Jewish studies of Talmud as taught today in Jewish theological colleges and universities. In words of his publisher Abraham Freimann he invested huge effort and succeeded in laying a sound foundation for the structure of Talmudic history. In a sense, this book is a wonderful gateway to the strange world of the Talmud, so thoroughly forgotten by mankind, and still so beguiling. He was a true Renaissance man, open to facts and new ideas as well as attached to tradition. He included in his Book of Lineage some controversial (for his time) ideas and facts. He accepted the great Jewish Gnostic Elisha as an important sage, saying: remember his wisdom and forget his faults. He published the story of the Zohar, how this great book of Jewish mysticism was found in Spain. For this reason, his book was banned for ten years by the Rabbinic authorities and remained out of print for a hundred years, being spread in carefully observed manuscripts. In the 19th century Zacuto was rejected by Heinrich Graetz, an “enlightened” Jewish historian who loathed Orthodoxy and Rabbinic Judaism. His hatred of Zacuto spilled over onto his first publisher, the learned Dr Shullam: Graetz accused him of wasting the money of a wealthy Jewish widow on such an unworthy project as publication of the Book of Lineage. With his usual venom, this secular modern Jew, Graetz, wrote of R. Zacuto: '(A) man of limited understanding, unable to rise above the superstition of his day,… he failed to give a complete sketch of the sufferings of the Spanish and Portuguese Jews.’ His own idea of ‘complete sketch’ was much whining and many colourful epithets like cruel, bloodthirsty, innocent, etc. The cool style of Zacuto and his allegiance to the faith of Israel were equally foreign to him and to subsequent secular Jewish historians. Nowadays, we are ready to accept history for what it was, without attempting to re-write it. Here we find a great friend and councillor in the towering figure of this sage spanning the gap between the Middle Ages and Modernity. This project was realised, despite immense difficulties, thanks to guidance and inspiration provided by Dr Vladimir Rozenblit whose interest in the Jewish history and tradition moved us forward. His hands-on involvement brought this work to conclusion after some five years of efforts by many scholars, sages and translators; though the final responsibility for the text in front of you lays with the editor and translator, Israel Shamir. The Book of Lineage was a life-long work of R. Abraham Zacuto, commenced in 1480s in Salamanca and completed probably in 1504 or 1505, half a millennium ago, in Tunis. Its first printed edition came out half a century later in Constantinople, published by the great scholar Dr Samuel Shullam, who added his own pertinent and amusing remarks always beginning with ‘Samuel Shullam said’. They appear in our translation in square brackets. In the copyright-free world of 16th century some parts of the text were removed and replaced with a potpourri of other historical chronicles, namely, the Antiquities of Josephus, Josippon, Seder Olam etc; but numerous MSS of the Book of Lineage found their way to the Hebrew reader; they contained the parts removed by the first and subsequent publishers. The Medieval Hebrew/Aramaic text of the Book of Lineage we used was established by Herschel Filippowski (Edinburgh 1857) by skilfully combining the MSS and the printed versions. He also added his interesting notes; they appear marked with his acronym ZHF. Though Filippowski planned to produce a companion volume of sources to the book, it was never published. Still his copy based on the Oxford MS remained the best scientific text of the book and it was republished with extensive notes by Abraham Haim Freimann (Frankfurt am Main 1924). Freimann added The Chronicles of the Kings of Israel and the Kings of the Nations, previously published by Abraham A. Neubauer, subtitled ‘Part Six of the Book of Lineage’, though the division into six parts was done by Filippowski (as he says in his Introduction) and was discarded in this edition. The polylogue feeling was reinforced by introduction of marginalia by R. Jacob Emden, an important German Talmudist (1697 – 1776). His notes are partly retained here, in square brackets, marked ‘Yavetz’ (Jacob b. Zvi). There are notes by scholars Dov Goldberg, Thomas Glick and others. We used the text republished with many sources revealed in 2004 by Yarid Sefarim of 6, Mea Shearim, Jerusalem. This was also prepared with the grant of Zacuto Foundation. A reference to the Talmud by default is to the Babylonian Talmud (Bavli), while a reference to the Palestinian Talmud (Yerushalmi) is marked PT. Almost always the majority reading of Soncino is preferred. 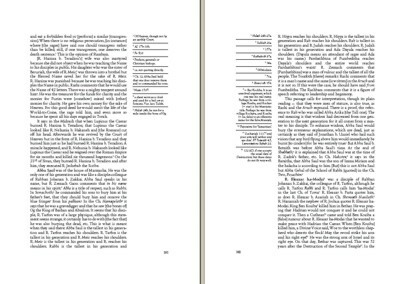 Thus a reader armed with Soncino (available and searchable online, on a CD and in hard copy) should be able to find the relevant text. H corresponds to Heh, while A corresponds to Alef. Thus Raba רבא ends with Alef, while Rabah רבהends with Heh. זירא is Zera, while זעירא is Zeira. Wherever feasible, H is employed for both Heh and Heth, following the usual Scripture spelling. Taw is usually represented by TH. We tried to avoid using apostrophes and special signs for Ayin and Alef. The names that appear in the Bible pertain the spelling of King James Bible. As for titles, we use R. for Rabbi and Rab. These titles are given in full whenever it is necessary to distinguish a Babylonian Rab from a Palestinian Rabbi. Following Buber, we used Master and Disciple for the most important interrelation of the sages rather than ‘teacher-student’. There are very few abbreviations excluding the usual abbreviations of the books of the Bible, and the honorific titles: for the dead, that is ‘obm’ – ‘of blessed memory’ or similar; and ‘pbuh’ – ‘peace be upon him’. Only two-word-long titles of the tractates of Talmud are abbreviated, thus AZ is Avodah Zarah; MK is Mo’ed Katan; BK is Baba Kama; BM is Baba Metzia, BB is Baba Bathra; RH is Rosh Hashana. The Soncino translation of Talmud was used for the relevant quotes, unless they had to be modernised, and for spelling of Hebrew names. For non-Jewish names, the spelling of the Encyclopaedia Britannica was preferred wherever available. There are very few transliterated (not translated) words in the text, as we tried to make this book accessible to an English reader. The usual terms of Jewish faith, e.g. Torah, Halizah, Trefa etc. can be found in Soncino Talmud Glossary, also available online. Quote marks are used sparingly, for they were not employed in our sources. Instead of attempting uniformity and abundant but misleading lucidity (this would lead us to employing up to five kinds of quote marks) we tried to achieve a user-friendly translation blurring somewhat vague distinction between a direct and indirect quotation. The titles of Talmud and Mishna Tractates are transliterated and italicised, thus Shabbath is the Tractate, while the day is called Sabbath, as usual. The names of Hebrew books are usually transliterated, unless well known in their translated name, e.g. Introduction to Mishna by Rambam, but Menorath ha-Maor by R. Aboab. Round brackets ( ) are employed to facilitate reading, and the words in these brackets are an integral part of the text. Square brackets [ ] are employed to show logically or grammatically needed words; or those present in the source (the Bible, the Talmud, the Book of Tradition and other sources); or available in other MSS and earlier printed editions, as well as marginalia of R. Jacob Emden, notes of Herschel Filippowski, Abraham Freimann and Samuel Shullam. The dates in the square brackets are supplied by us as a guidance only; a year by default refers to the current Gregorian calendar. AD and BC are omitted when obvious. AM is Anno Mundi, i.e. year since the Creation; usually it refers to the Jewish calendar, but in the Chronicles this is often a reference to the older Christian calendars based on calculations of St Augustine and Isidore of Seville. While the world was created, according to the Jews, on Oct. 7, 3761 BC, the Christians moved it back to 5199. Our main problem was embedded in the frame of reference. Rabbi Zacuto knew his Talmud by heart, and he wrote for equally endowed sages. A word or two would suffice for such a reader to remember an amusing or exciting episode. He had no need to tell the stories, as they were known to his readership. We wished to create a book for a lay reader; thus we had to narrate some of episodes. Usually these stories are relegated to the notes on the margins. Some of them were so delightful that it was difficult to stop. But otherwise this book would grow well over thousand pages. But hopefully our reader will feel encouraged by this presentation of the wisdom and wit of the Jewish sages, and will delve into the sea of Talmud. This was the greatest wish of Rabbi Abraham Zacuto. The family of the author of The Book of Yohassin is known under names of Zacut or Zacuto, Zakuto, Zakudo in various spellings. At first, Zacut family resided in France. When in 5066/1305 the Jews were expelled from France, they moved their tents to Spain, among them, notably, The Rosh. The R. Abraham Zacuto the Elder was the descendent of those refugees and he left his good name to his grandson R. Abraham Zacuto the Second. The latter’s son R. Samuel Zacuto was the father and master of the author of the Book of Yohassin. Among his maternal ancestors, there was renowned R. Samuel Balansi [Valenci] the greatest in knowledge and wisdom of the R. Isaac Abuhab’s disciples. He died five years before the Expulsion from Spain, being 52 years of age. R. Abraham Zacuto b. R. Samuel b. R. Abraham was born in Salamanca in Castile about 5200/1440. In his youth, he studied Torah under guidance of his father Samuel who was apparently a R. [haham] and received the rabbinic tradition from the late ancestors and masters OBM. R. Abraham quotes his father as the source, [for instance] why the sons of Rab Papa are mentioned after completion of a tractate? His father told him, he heard it is good for memory to invoke their names seven times, as we mention Elijah [the Prophet] OBM following the end of Shabbath. When R. Abraham was six or seven years old, he saw in person the old R. Isaac Campanton (d. 1463), the chief R. of the Castilian community who was called Gaon by his contemporaries (the usage of the title was not common in those days). The outlook of “the meek pious man with the Holy Spirit of God” impressed the child greatly. In the old age he wrote, “Whoever saw him saw the face of Divine Presence.” But the real master of R. Abraham was R. Isaac Abuhab, “the sharp-wit innovator.” He had many disciples and authored a book of the Four Columns, which remained uncompleted. He was the source of R. Abraham Zacuto's knowledge of the Talmud, of Poskim and of the Kabbalah wisdom. R. Abraham Zacuto knew inside out all Babylonian and Jerusalem Talmud, as we see the Sefer Yohassin. His greatness and wit are seen in his own replies in the discussion on Maimonides [as quoted by Maharal b. Habib, Responsa 19]. His native Salamanca was the capital of [mundane] learning of his days. R. Abraham read astronomy and mathematics in the Salamanca University. He succeeded in his studies and became a famous astronomer. The bishop of Salamanca, an adept of astronomy, became aware of his abilities and nominated him a professor of the Salamanca University. R. Abraham taught in the University and many of his disciples, Christians and Jews, became prominent scholars. One of them, Augustine Ricci, gained renown as a famous astronomer. In those days, R. Abraham Zacuto compiled his great work on astronomy by orders of the Bishop of Salamanca. His astronomic tables seemed miraculous to his contemporaries. His first publisher R. Samuel Sholem wrote in his introduction, “All preceding tables of Gentiles were as naught and the Gentiles broke and discarded all previous tables and adopted his wonderful creation forever and ever.” R. Abraham Zacuto also improved the astrolabe and made it of copper instead of previously used wooden astrolabes that were not precise enough. His innovations and discoveries made him well known. It seems R. Abraham Zacuto had dealings with Christopher Columbus, the discoverer of America. Columbus stayed in Salamanca and apparently, R. Abraham Zacuto showed him some astronomic books including the book supposedly written by R. Abraham Ibn Ezra. R. Abraham Zacuto was among the very few scholars who believed in successful completion of Columbus' journey. The contemporary scholar Gaspar Correa quoted in his book the following opinion of R. Abraham Zacuto: “The Land of India is exceedingly remote and seas and lands separate us from it; still whoever will risk the journey unavoidably will reach it.” R. Abraham Zacuto's tables always accompanied Columbus in all his travels and once, during his last voyage to America in the AM 5264/1504 they saved his life. Columbus visited Veragua, where he found plenty of gold. After leaving Veragua, his fleet suffered from a terrible hurricane and in terrible plight, he reached Jamaica. Caciques (native chiefs) were hostile and did not want to provide him and his people with food so they were on the edge of starvation. Columbus conceived a trick to save his life. R. Abraham Zacuto's tables told him there would be soon (on 29 of February 1504) a lunar eclipse. Columbus assembled the Caciques and promised he will put a spell on them by withdrawing the moonlight. During the eclipse the Cazics were frightened and prayed to Columbus to remove the spell. Columbus pretended praying to his God, the eclipse passed and since then the Caciques respected him and provided with all he needed. It is written in the book on Columbus' voyages. The copy of R. Abraham Zacuto's tables with marginalia of Columbus is extant in the Colombian library in Portugal. Besides his astronomical investigations, R. Abraham Zacuto dealt also with astrology that he trusted and believed in. He was not above belief in demons and other superstitions. In his book, he wrote about a Gentile whom he met in Salamanca. The Gentile's voice was heard from the roof of the building though he sat quietly inside the house. He also reported that certain Jewish women could prophecy in his presence. Later R. Abraham Zacuto apparently moved to Saragossa and taught in the University, while his wisdom and knowledge grew. In AM 5252/1492, the Castilian king Fernando ordered to expel all Jews of Spain. R. Abraham Zacuto was forced to leave his home country. He saw those righteous people who preferred to kill themselves and their children rather then be forced to transgress the commandments of the Lord. R. Abraham Zacuto moved together with his master R. Isaac Abuhab to Portugal and settled in Lisbon the capital of the country. Seven months later his master died and R. Abraham Zacuto lamented him by quoting the verse See, I am sending an angel ahead of you (Ex 23:20). The fame of R. Abraham Zacuto preceded his arrival to Portugal and King Joao II who was a keen adept of astronomy and engineering provided him with a university cathedra. The king liked R. Abraham Zacuto and gave him the honorable title The Royal Astronomer. When the king visited Turi di Tombo in AM 5254/1494 he presented “Abraham the Astrologer” with ten golden coins. It is written in the book of Nishmath Chaiim, once the King Joao came to try R. Abraham Zacuto's wisdom by riddles. He said he intended to travel to Iborra and demanded to read by stars through which gate he will enter Iborra. R. Abraham replied, “Whatever I will say, you will enter by other gate.” The King said, “No, put your divination in writing and seal it with your own seal.” He brought clean sheet of paper and wrote, “The King will open a new gate and enter through it.” So it was - the king wanted to prove that his fortune telling is false and broke a new gate into the city and entered through it. As he entered, he opened the R. Abraham Zacuto’s letter and read it aloud and it was a miracle in his eyes. After demise of Joao II, his grandchild, Dom Manuel sat on the throne of Portuguese kings. He nominated R. Abraham Zacuto to be his astronomer and secretary. In AM 5256/1496, the tables of R. Abraham Zacuto were published in Liria, in the printing house of Master Samuel di Ortas. They spread in all lands of East and West, “in the countries of Edom and in the lands of Ishmael.” R. Abraham Zacuto wrote about it: “I have been in the kingdom of Spain and in other Christian kingdoms when my books on Astronomy were published and people said “[it is written by] R. Abraham Zacuto of Salamanca. I am entitled to be proud of it as our Sages OBM said: “What is the wisdom that the Gentile nations appreciate?” and they meant the calculations of stars of Zodiac and of periods of time. I bear witness to heaven that they glorified [the people of] Israel for it” It was said that R. Abraham Zacuto's advice on wisdom of stars to the Gentile nations and their kings is as good as Ahitophel's advice of old. During his sojourn in Portugal, R. Abraham Zacuto came to new conclusion about the origin of storms and gales in the equinoctial regions. His investigations proved it is possible to reach India by circumventing Africa. In AM 5257 [1496 CE], King Manuel equipped the fleet under command of Vasco di Gama to search for the way to India. Before his departure, Vasco di Gama sought R. Abraham Zacuto's advice in presence of his sailors. King Manuel invited R. Abraham Zacuto to the city of Beja and the astronomer told him that India soon would belong to Portugal. It became true, as we know. R. Abraham Zacuto went with many other exiles to Africa and settled in Tunis, there was “a big community, wealthy people and great believers in the tradition [Kabbalah] of Torah.” Among the Portuguese exiles in Tunis, there was R. Moses Alaskar as well. The troubles and destitution caused by exile wore down the strength of R. Abraham as he admitted: “For my sins, for all these destruction and captivity and lack of food, I have nor strength, no wisdom, neither sense of distinction”. In Tunis, R. Abraham Zacuto completed his Sefer Yohassin but he was short of [reference] books, as there were no books in Tunis except what the exiles brought with them. R. Abraham Zacuto stayed in Tunis for a few years but apparently he could not find peace for his soul and left for the Middle East, to Turkey and at the end of his days to Syria and to Land of Israel. He settled in Jerusalem and died there in AM 5275/1515. Among colleagues of R. Abraham Zacuto, there was the perfect scholar R. Abraham ha-Levi Bokart, mentioned by R. Abraham Zacuto in Sefer Yohassin. It appears he is identical with R. Abraham b. R. Eleazar ha-Levi, R. Abraham Zacuto” brother in law who wrote a few books on Kabbalah, including Galya Raza (Disclosing Mysteries) and Sefer Zikaron (The Book of Memory). Among his better-known disciples, there was R. Joseph Vecinho, the physician to the King Joao III and a member of the Lisbon Junta. The Junta was the group of scientists, astronomers and navigators. R. Joseph was a colleague and an adviser of Columbus. He translated the explanation of R. Abraham Zacuto’s Tables into Latin. R. Abraham Zacuto’s grandson, R. Abraham Luzitanus, was a great physician and a wise man. The Hebrew medieval historical literature is rather lean and mean. The historiographers described events and tales, marked years and dates but they could not present events and personae dramatis within the whole historical and spiritual context of their times. They could not express the rise and fall of spiritual movements or show us some great historical personage by making him alive through exaltation of their own spirit. They could not integrate the details into a united and live presentation. Such purposes were foreign to the historiographers, as they did not consider history as a separate independent branch of knowledge. The historiography was not writers” art, they thought. They intentionally limited their scope: some described the miracles to enhance the faith and arouse the spirit of believers, some preferred to dispute with Christians and free thinkers by compiling the traditions of transmission of the Oral Torah and Kabbalah. They usually considered their work as subsidiary to the establishment of the Halachah, the Rule of Torah. It was necessary to know the lives and times of the sages of Talmud and Mishna in order to determine who preceded whom and whose judgment prevails according to the rule of the oldest decision. The Book of Yohassin conforms to the rule. The main intention of R. Abraham Zacuto as the author of the book was to help the Talmud scholars, as he states openly in his foreword. That is why R. Abraham Zacuto concentrates his attention and efforts on the first articles in the book dealing with the Talmud personalities. He writes at length about the Sages of Israel and tries to establish rules of preferment of Judgment. His second aim was to support the Jewish side in disputes with Christians and he frequently refers to the opinions of Christian laity and clerics and of Jesus himself. Chapter six of his work contains much of the Jews-versus-Christians polemics. The Book of Yohassin exceeds all previous historiographic writings by its completeness and perfection of the first chapters dealing with the Mishna and Talmud personae. R. Abraham Zacuto invested huge effort in it and succeeded to lay a sound foundation to the structure of the Talmudic history. R. Moses Haggis was right saying, “If you wish to quench your thirst and to find the origins and descent of the Sages of Mishna and Talmud and to learn everything about them, their names and their virtues, keep close to your heart this pleasant book and it will encourage your spirit to study the Oral Torah” (Mishnath Chachamim, 625). R. Abraham Zacuto invested “many labors” and worked for many years. The scientists are still divided as to the year when the book was written. Zunz presumes the book was completed in the year AM 5262/1502 but the majority of experts prefer the year AM 5264/1504 (Graetz, Keizerling, etc). The author of Zemach David gives the year AM 5263 [1503 CE]. Lev considers the chapter 6 being written in AM 5264 [1504 CE], while previous chapters were written in preceding years. In the chapter 3, there is a reference, which was missed by scholars. On page 204a, R. Zacuto writes, “This year is a thousand-year anniversary of the completion of Talmud and 73 years since the demise of The Rosh.” By R. Zacuto’s counting, it is the year AM 5259 [1499 CE]. Still there is no need to choose a specific year, as it appears that R. Zacuto wrote some chapters in Portugal before the Expulsion, while other chapters were composed in Tunisia. The best proof can be found on folio 22a, where he states that in Tunisia he had just a few books, namely Nezikin the Jerusalem Talmud and the Midrash Levitcus Rabba, etc. In his first chapters, he freely quotes all tractates of the Jerusalem Talmud and all Midrash Rabba books. It proves that he wrote his book over number of years. Various chapters were composed at different dates. Answer that is more precise we can find by inspecting his other books. In the introduction to his Astronomical Tables or Perpetual Almanac, R. Zacuto promises to compose a book on the Sages of Mishna and Talmud. The introduction to the Book of Yohassin also states that he considered the book as a certain supplement to his previous books on astronomy. He writes, “This book is similar to the books on wisdom of numbers and stars and a virtuous deed causes other virtuous deeds.” It means that R. Zacuto started this book after completion of his Opus Magnum in the year 5238/1478. In the year 5270/1510, R. Abraham of Trotial composed his book of Kabbalah and he quotes frequently the Book of Yohassin. It proves the Book of Yohassin was composed between 5240/1480 and 5270/1510. During those years, R. Abraham Zacuto collected the vast material for the book and carefully presented it in the first three chapters on the sages of Mishna and Amora. The following chapters were written hastily after the Expulsion and the author had no time to arrange them properly and left it as an uncompleted compilation of various and contradictory sources. The last chapters of the Book of Yohassin have great historical value, as for instance the narrative on Book of Zohar. The Book of Yohassin is our only primary source on the matter as the other writers just quoted the book of R. Zacuto. Nevertheless, the first chapters dealing with the Mishnah and Talmud scholars are also important as R. Zacuto compared various manuscripts and printed books to present the reader with correct versions. The latter glosses are also important, especially those by the first publisher R. Samuel Sholem who quoted many old and otherwise lost, books. For many years, the Book of Yohassin was the most important of historiographic Jewish books. The previous generations of our forefathers in the darkness of the Diaspora read this book to enliven their souls. Despite the reassessment of modernity, the Book of Yohassin remains an important step on the road from the mist of tales and legends to the light of scientific exploration. R. Asher b. Jechiel. Popularly known by the initials of his name: The Rosh and so designated hereafter. Eminent Talmudist; born in western Germany about 1250; died in Toledo, Spain, 1328. R. Asher b. Jechiel was the most prominent disciple of Meir b. Baruch of Rothenburg. Of the Rosh’s extant works, his abstract of the Talmudic laws (Halachahs) is where his fame rests. Omitting the haggadic portions of the Talmud, and all the laws not practiced outside of Palestine, such as the sacrificial, criminal and political ones, Asher made an abstract of the practical Halachah, leaving out the discussions, and concisely stating the final decisions. The Book of Yohassin, folio 223a. Rab Papa Saba, a disciple of Rab. His ten sons are mentioned whenever a tractate is completed in a celebratory prayer called Hadran. Rabbinical authority on halachic questions. Keizerling on Columbus, pp. 13, 45. Correa, Lendas da India, quoted from Keizerling, p. 45 note 3. Libro deProfecias, p. 59, quoted from Keizerling, p. 43. It is written in Shosheleth Kabbalah, page 50:71 and in the book Neshmat Chaiim quoted from Keizerling, Portugal, p. 121. However, in his book on Columbus (p. 41) he wrote that R. Abraham Zacuto never lived in Saragossa. Keizerling, Portugal, p. 121, note 5; Columbus, p. 99. Neshmat Chaiim by R. Menasseh b. Israel, BT Chagigah, chapter 23. Gaspar Correa, Lendas di India, quoted from Keizerling, Columbus, p. 99. Keizerling, Portugal, p. 162 and Columbus, p. 100. Author’s Introduction to the Sefer Yohassin, folio 1a. Keizerling claimed he died in Izmir (Smyrna) but could not prove it. The date is according to Ramshash, p. 101.